namaḥ (n/V) – adoration, homage; śata (n) – a hundred; śarad (f) – autumn; candra (m) – moon; sampūrṇa – completely filled, entire; paṭala (n) – roof, veil, chest, heap; ānane (f/V) – face, mouth; tārā – a fixed star, asterism, Tārā; sahasra (n) – a thousand; nikara (m) – heap, essence, treasure; prahasat – laughing, smiling; kiraṇa (m) – ray, beam; ujjvale (f/V) – blazing up, luminous, lovely, glorious. In the perfect, spacious constellation of a thousand stars. The second verse is homage to Yangchenma (byaṅ chen ma)Tib, the “Treasure of Wisdom”. The “Lady with a shining face like an array of hundred autumn full moons,” means her face is a hundred times fairer and more beautiful than the moon. Her right hand holds a mirror, which is like a full moon engraved with an HRĪ1 syllable. The “perfect spacious constellation of a thousand stars,” refers to the field of her wisdom, which is abundantly spacious, and vast, like the countless, resplendent rays of the full moon. This light clears the darkness of the ignorance of practitioners, which is the cause of dullness, disease and possession by evils. It opens the door to the treasury of knowledge by illuminating the light of the four specific perfect understandings. These are the perfect understanding of the Dharma2, (teachings) the perfect understanding of the definitive meaning, perfect confidence (in the doctrine) and the perfect knowledge of the Victorious Ones, (brilliance). According to a tantra, the inner meaning is “to serve the mother of the sphere” which means emptiness or the nature of mind. In order to look at our innate self, the face of the ultimate Vajravārāhī, we must accumulate merit3 and purify our mind-streams4, so that they are like an “array of a hundred pure white moons.” Because of these practices, the door to her blessing will be opened by our true inclination. In that way, we can see ultimate luminosity and ignite our dynamic wisdom. 1 HRĪ syllable ~ Seed syllable of Avalokiteśvara. 2 chos, chö, dharma skt ~ It is an ambiguous Sanskrit term meaning 1) reality, the way things are, 2) phenomena (often in the plural chos rnams, chö nam dharmāḥ skt) and 3) the teachings of the Buddha. Here we can take it as spiritual path. 3 merit ~ Good karma, the energy generated by positive actions of body, speech and mind. 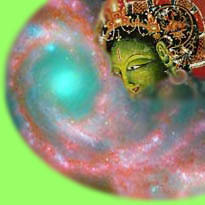 4 mind-stream ~ The continuation of consciousness, Buddhist way of expressing our mind.